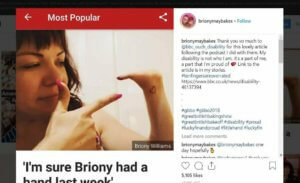 The name Briony Williams will no doubt be familiar to fans of the Great British Bake-Off, but for those who don’t follow the series, you might be interested to learn that Briony, a former contestant, has a disability – her left hand stops at the wrist. At no point did the show mention her disability and, in fact, it took about three episodes for the viewers to even realise. Apparently, this was a conscious decision between Briony and Channel 4: “I specified early on that I didn’t want them to make a big deal out of it because I just wanted to see how people would view it,” she says. Some might think that Briony would have struggled, juggling bowls and utensils, slicing and kneading and whatever, but Bristol-born Briony never let what she calls her ‘little hand’ stop her from getting on with the competition. The contestant, who won ‘star baker’ during pastry week, was given the option to use special equipment to help her during the competition but she refused. Briony, aged 33, says that her disability is “a part of me, not all of me” before adding: “It’s not that I’m embarrassed about it or ashamed of it in any way. I want to be there on my own merit and I don’t want people to think that I’m getting special treatment. Despite making it to the semi-final, sadly Briony was knocked out of the competition during Patisserie Week. You can read the full article about Briony in the Independent here and follow her on Instagram @Brionymaybakes.